Launched in 2018, our referral program couldn’t be easier to use! We want to reward you for talking about us, so the next time you’re in, ask your Stylist for business cards. Put your name on them and start handing them out. Ask the person you refer to bring it to their first visit and each time one gets returned to us, we’ll give you $5 off your next visit as a thank you. Coming soon – the option to pass referrals digitally! When you join our Birthday Club we’ll send you a coupon at the beginning of your birth month. You can use the coupon throughout the month on the services of your choice. Our Birthday Club is the perfect way to treat yourself on your birthday by trying a new service. Here’s the best part…being a part of our Birthday Club is totally FREE, you just need to sign up. Click here to sign up now. Salon Nouveau offers monthly specials and promotions from time to time. We typically announce them via email and on our social media accounts. The best way to stay in the loop about our promotions is to join our mailing list. We only email once, or twice, per month and we never share your email with any one else. Ready to stay up to date on everything that is happening at Salon Nouveau AND take advantage of our savings offers? Join our mailing list. 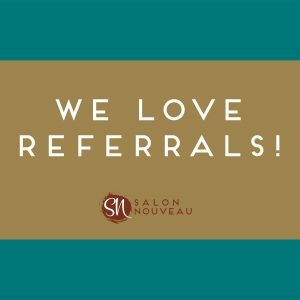 Salon Nouveau has both renters and employees that work at the salon. Some renters do not participate in our monthly promotions. If you’re interested in taking advantage of one our specials or promotions and you see a specific Stylist, please ask them if they participate in our promotions before booking.